NEARLY 11,000 COPIES SOLD AS OF MARCH 2019! The Only Academic Phrasebook You’ll Ever Need is a short, no-nonsense, reader-friendly bank of academic "sentence templates." It was written for both graduate and undergraduate students who already know the basics of academic writing but may still struggle to express their ideas using the right words. 1. Establishing a research territory: The last few years have seen an increased interest in ____. 2. Describing research gaps: To date, no study has looked specifically at ____. 3. Stating your aims: The aim of this study is to discuss the extent to which ____. 4. Describing the scope and organization of your paper: In chapter ____ , the concept of ____ is further explored. 5. General literature review: A number of scholars have attempted to identify ____. 6. Referencing: In his 1799 study, Smith argued that ____. 7. Sampling and data collection: Participants were randomly selected based on ____. 8. Data analysis and discussion: The data provide preliminary evidence that ____. 1. What's the difference between "effect" and "affect"? “Imply” and “infer”? "They're", "their" and "there"? 3. Do you say "the criteria was" or "the criteria were"? The Only Academic Phrasebook You’ll Ever Need is NOT a comprehensive academic writing textbook. It will NOT teach you key academic skills such as choosing the right research question, writing clear paragraphs, dealing with counter arguments and so on. But it will help you find the best way to say what you want to say so you can ace that paper! The Ultimate Guide to Academic Writing With Phrase Book and Guides in MLA, APA, Chicago, and Harvard Styles. Master academic English essay scholarly style and improve your vocabulary with this book! Luiz Otávio Barros is one of the most brilliant language educators I have met in my career: he has an intuitive grasp of language genres and language use, and is a personable engaging teacher. This book reflects his brilliance: comprehensive, well-researched, easy to navigate, tight presentations. I highly recommend the Kindle/e-book version because you can take advantage of the instant cross-referencing of terms. Barr-avo! Extremely pleased with this purchase. It turns out, you can use it to tremendously enhance your studies on the English language, whether writing Academic papers or not. I intend to get back to my studies here in the US soon and it's definitely comforting to know I can count on such rich material to help me out. A thousand kudos to Luiz Otavio, as always! I purchased this book because I thought it might be useful for my ESL and writing tutees. It far exceeds my expectations. 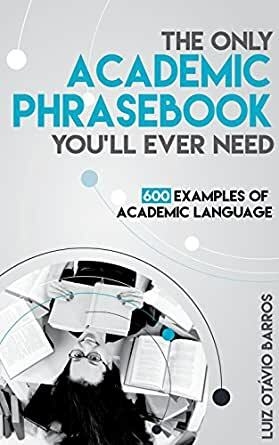 This academic phrasebook is useful for native English writers and ESL writers alike at both undergraduate and graduate levels. Even experienced research writers will find it useful. For instance, my favorite chapter, "Chapter 6 Referencing," gives 43 ways to introduce in-text references. So if you are tired of saying, "According to . . ." and "X reports that . . . ," this book is well worth the price. Basically, I have no words to express how good and useful this book is. It seeks to shed light on how to better write dissertations, essays etc, by providing the user with chunks they might not even imagine themselves using. I believe it is somewhat hard for one to easily come up with such phrases as "The theoretical framework underpinning this study is..." or "A number of studies have shown that... . However, important questions regarding N remains unanswered." In my humble opinion, these are beautiful and interesting phrases for an assignment, to say the least. I highly recommend this book for anyone preparing their final academic papers and for language teachers as well. Seems to be written for beginning undergraduate students who have not been exposed to reading professional articles. It is also written as a fill-in-the-blanks kind of training that includes spelling and grammar. Not for the advanced student.